Over at our sister website, www.constructandconfigure.com, we have been busy putting together our third showcase demo interactive application using the Construct and Configure Interactive Application. In this demo we used the existing application, but decided the push the number of options and configurations by showing how the app could be used to visualise a vehicle, in this case a Mini Cooper, a car of which I’ve admired since it’s release 15 years ago. 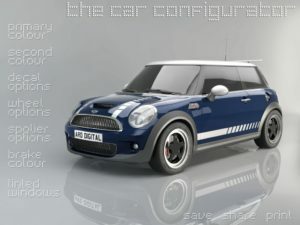 Configure the Mini Cooper on any device. 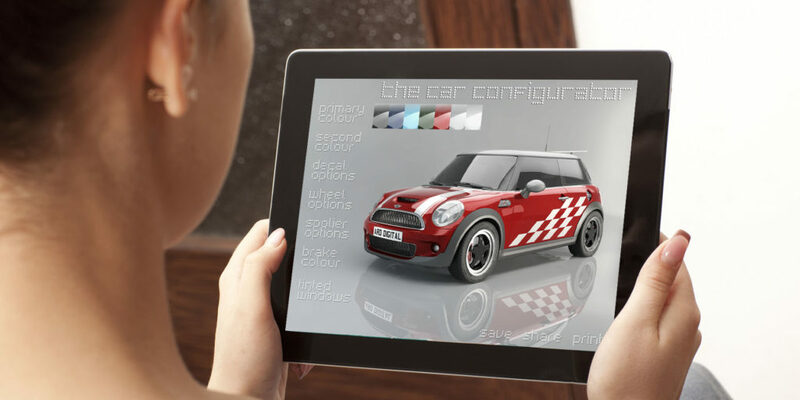 In the app you can configure the paint colours, wheels, brake calliper colours and much more. Creating this app was slightly more complicated to create than the kitchen configurator and the furniture configurator simply because of the number of options. We could have added more options, there are no limits within the application its self, but felt the number of configurations possible (27216 unique configurations to be exact) was enough to give a taste of how powerful the application can be. Visit the app website to test the configurator. We also wanted to showcase the layering of the various CGI elements and options. For example the decals sit perfectly over the paint work, and the brake callipers sit under the wheels, all of which is reflected perfectly on the floor. OK we like to show off, but we’re proud of what we’ve created, and we feel this demo shows the potential it has to showcase any product. In other Construct and Configure news, development of the Share function has begun, and will hopefully be complete in a few weeks time. We’re really excited by this, as the Share function will make it extremely easy to share configurations with friends, family and anyone else via email and social media, which in turn will raise the profile of the products. If you’d like to know more about the configurator, please don’t hesitate to get in touch.